For bedecking and bedazzling yourself, there’s nothing more glittery than the jewelry from litter sf. These gals have jewelry for the shoes, body, head and ears. It’s downright saucy. See littersf jewelry here (but beware, they’ve been so popular, they’re selling out). I love beads and have ever since I wandered into a Santa Fe bead store run by a woman named Gloria of unknowable age with a glorious head of laquered white hair and a bad attitude. While I have collected them through my life (my favorites are from Prague), I’ve never gone so far as to string them. I just like to look at them, run my fingers through glassy piles. Although lately, with my haute couture embellishments class, I’m learning how to apply beads to garments, a task I took to with unforeseen and surprising love and tenderness. Well, I’ve landed on a wonderful etsy beading store, Gem Junkie, which has “gemstones and jewelry supplies for all your beading needs.” Just think, I don’t have to put up with Gloria’s bad attitude or trek to Czechoslovakia. And with the supplies available as well, I may even string a few together. Discover Gem Junkie here. Submitted by Marjorie Cunningham – Designer of Marjorie’s Cracked Plate Jewelry and Manager of the Reclaimed to Fame Market. Today’s featured merchant interview is with Christine Gable Epstein of Oceano Seaglass Jewelry. Christine’s jewelry is available at www.oceanoseaglass.1000markets.com. Genuine sea glass started out as broken bottles and glass and is naturally recycled by the movement of the sea and sand. It has a natural frosted beauty of its own. 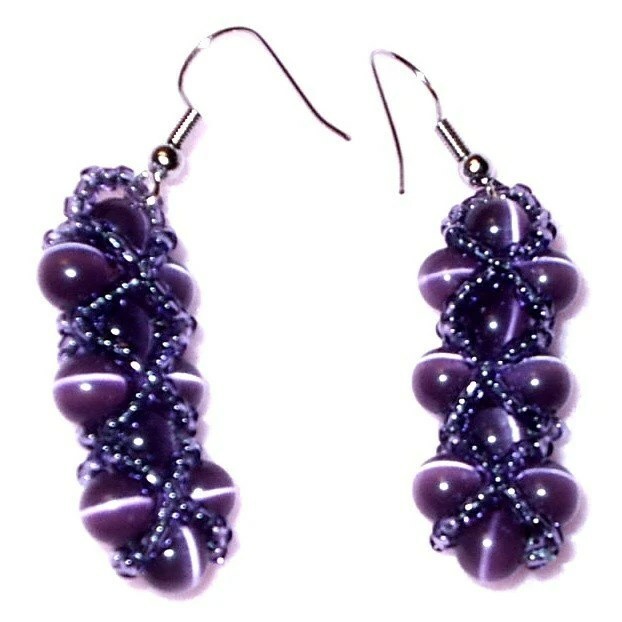 Christine, who lives in Puerto Rico, uses those beautiful sea gems to create lovely one-of-a-kind, handcrafted jewelry. I asked Christine how she found inspiration for her jewelry. “When my sisters and I were little, our grandmother used to make clothes for our dolls. Together we would comb through fabric scraps, lace, rick-rack and odd buttons, out of which would come marvelous little dresses. The magic of “from nothing into something” really made an impression on me, and instilled a life-long lust for art supplies! Is there a better day than when your supply order comes? That little carton, so full of possibilities! Here in Puerto Rico, I get to hunt and gather seaglass. I love every part of the process: the excitement of finding a perfect piece, washing the salt and sand away, laying it in the sun to dry, sorting the shapes, and matching the colors. This handling of the seaglass IS the design process for me, when each found piece presents its gemlike qualities and I develop ideas about the type of finished piece it will become. When you stop by her shop, you’ll see what a fabulous photographer she is, which makes her shop all the more attractive. Christine shares some photography advice for other merchants. Being a part of the Reclaimed to Fame Market, Christine is a strong believer in recycling, as are her neighbors in Puerto Rico. “We live off the beaten path in a small fishing village. In our neighborhood, nothing goes to waste. If you prop up anything marginally useful next to your garbage can at 6am, it will always be gone by 9am. Very little gets ‘trashed’. All artists have a creative process and here is Christine’s. “It seems natural that I would wind up designing and making jewelry. I’ve always been interested in fashion, and my art school training serves me well in terms of working with color and design. Coming from a family of seamstresses also means that I have a love of anything tactile and a yen to do something useful with my hands. These things all contribute to the way that I think about and handle my materials. Part of my process is built around awareness for the safeguarding of the environment. Oceano jewelry is handmade from recycled material because I want to unite my need to create with my views and beliefs. While I’m creating jewelry, I also keep in mind the notion that I am making tiny pieces of kinetic sculpture that interact with and respond to the wearer. Stop by Oceano Seaglass to see what Christine has available there. And also check out her blog at http://www.oceanoseaglass.blogspot.com. Posted by Marjorie Cunningham, broken china jewelry designer at Marjorie’s Cracked Plate Jewelry. One of the nicest jewelry designers you’ll ever meet online is Marilyn Southmayd of Freer, Texas whose jewelry is known as Grandma Marilyn’s. Always ready to help new jewelry makers with advice and encouragement, Marilyn is a delight to know. The slogan on her website is very true: “If it’s on this site, it’s handcrafted with love”. Marilyn shared her jewelry adventure with me. “Back in the ’80s, my first husband’s mother was making some little dolls and had nowhere to sell them. I started making soft sculpture dolls, and we started going to craft fairs. I let her believe that she was tagging along with me. In reality, I was going to the craft shows so that she could sell her crafts and get a little pin money. Then I found some beaded earring books in the craft store. I started making some really pretty earrings to sell at the craft shows. They did fairly well. For some reason, we quit going to the craft shows and my beading fell by the wayside. Then, around, September, 2005, I needed something to help me make some money as we had lost everything and my second mother’s husband was supporting us until we could get back on our feet. I started making Christmas Crystal Snowflakes since it was right before Christmas. Those sold pretty well. I sold at least 17 of them. I was so excited. From there, I graduated to making bracelets with wire and acrylic beads. Then in December 2005, I found the internet bead groups and went wild. My first project was a bracelet by Glenda Payseno called the Fab 50’s Bracelet from her Beadchat group. Glenda is such a giving person and uploads quite a few of her patterns for her members as well as sells them on Lulu and ReadytoBead as patterns and kits. My beading continued to improve with this lovely roundlace necklace created from a bracelet pattern by Sandra D. Halpenny. Since then, I have created so many patterns created by wonderful designers that I cannot list them all here. You can see the pretties that I created either in my GrandmaMarilyns Etsy store, my Picasa Web Album, or my Flickr album. You will find the links to the patterns in the description if I used a pattern. 1. Make yourself an avatar and banner that people can identify with your shop. Your avatar will show up in any of the messages you put in the forums or anywhere else. 2. Make sure you get good pictures of your items. Especially make sure that your pictures are in focus. Don’t have the pictures cluttered. Once you take them, make sure you crop them down to the item only and do any other editing that needs to be done. Make the first picture your best one showing your item. 3. When you write your description, sell your item. Make the potential buyer think that they have to have your item. 4. Make sure that you list colors in your tags. 5. Do not let your Etsy shop get static….spend time listing and relisting (at least 2-3 items per day is recommended), photographing (remember you need 5 pictures for your listing), editing, writing, learning, promoting, networking, blogging, checking the forums, mailing (if you get a sale), and keeping records.